Lately we’ve been getting camera companies marketing insane numbers of autofocus sensors on their mirrorless cameras. I keep getting questions about the relevance of those numbers. For instance, Canon advertises the EOS R with "5,655 manually selectable AF points.” Obviously, that must be “better” than the Nikon Z7’s 493 selectable points, right? Wrong in most practical cases. Most of the recent mirrorless cameras have phase detect sensing on the camera’s image sensor. As such, they all typically have thousands of individual focus sensing positions. 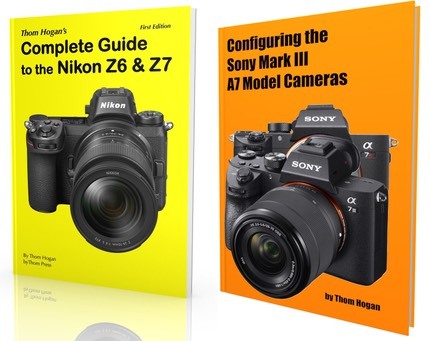 The Nikon Z series and the Sony A7/A9 series, for example, use most of the pixels on entire rows of the image sensor to capture focus information, they just don’t use every row. All cameras have focus area modes that consolidate multiples of those individual elements into a “group” that’s actually being used to actually detect focus. It’s that number of those selectable groups that’s usually highlighted in the marketing materials. So, for example, Nikon has 493 selectable points (groups) in the Z7, but each of those has multiple sensing points within it (unfortunately an unknown number since Nikon hasn’t published it). So we get marketing nonsense about how many selectable focus points there are, which doesn’t really tell us how discrete the focus system really is. The problem with a high number of selectable AF points is this: you’ll be slower to get the focus position to where you want it on your subject. One reason why I find the Nikon Z7’s AF-C focus system more problematic than the Nikon D850’s is that the Z7 has 493 selectable focus positions (in Single Point), while the D850 has 153. If you’re using the Direction pad or the thumbstick to move the focus position on the D850, you get to where you want to go faster than you do with the Z7. True, Nikon has provided a way of cutting the 493 points in half (you can then only select every other one), but that’s still nearly double the points to navigate when you’re you’re moving the focus position across the image area. If you’re moving the focus position manually via the Direction pad or thumbstick, generally you’re going to end up behind your moving subject with most mirrorless cameras. One exception to that is those that allow you to use your thumb on the rear LCD to quickly position the selectable focus point. Indeed, the more points a camera claims, the more I want the function of using my thumb on the LCD to control where the focus point is, as it’s the fastest way to move with a subject, or to move across to another subject. None of the camera makers disclose how the selectable focus points correspond to the underlying phase detect positions on the image sensor. However, in every case multiple phase detect points are being used, even in modes such as Pinpoint AF (Nikon Z series). Watch out, though, as we have some lower-cost cameras—the X-T100 comes to mind—that have substantially less autofocus coverage area. 40% of the image area in the case of the X-T100. Yet the X-T100 claims 91 selectable autofocus positions, which seems like a high number if you’re coming from a DSLR. Like DSLRs, the Fujifilm’s focus ability is centered in the sensor and doesn’t cover a large area, though. So, don’t fall for the marketing lines where numbers are surrogates for something. Look for the actual useful number (again, percentage area of the imaging frame that’s covered). There will be plenty of actual focus sensing points in whatever area you choose. I’ll eventually update add another article with additional information that’s relevant to this discussion. The cameras that use rows of phase detect sensors—Nikon and Sony—do perform differently in some situations than the cameras that use all pixels (e.g. Canon). There’s much more going on with the autofocus system differences than the mere number of sensors that the marketing departments are promoting.